The weather in Norway has been terrific as of late, and this week-end provided me with not only a terrible sunburn (now there's a Farrah Fawcett - Wings connection), but was also an opportunity to catch up on my reading. There are good reasons why the book I reviewed earlier was called “The Beatles in Scotland”, while this one bears the title “The Beatles and Ireland”. While the Beatles played 22 concerts in Scotland at the height of Beatlemania, as well as having their first tour there as The Silver Beatles, Ireland on the other hand was only visited by the band once for a concert. On the 7th of November 1963, The Beatles gave their only concert in the Adelphi Cinema,Dublin (yes, Bob Geldof attended). That's talking about the Irish Republic, of course. Ireland is, as we know, divided in two, Eire or the Republic of Ireland became an independent country in 1922, but the British government refused the six northernmost counties to become part of the new republic. These counties then became Northern Ireland, which is part of the United Kindom of Great Britain and Northern Ireland (commonly referred to as the UK). Belfast is the capital of Northern Ireland, and in the whole of Northern Ireland there are today about 1,6 million inhabitants. The Eire constitution of 1937 has a united Ireland as a goal, but this demand has not been as strong of late, possibly because the Republic has experienced much economic growth for the past decade, something that can not be said about Northern Ireland. The Beatles also gave two concerts in Northern Ireland when they played in Belfast the day after Dublin, and gave a return performance the year after, on November 2nd, 1964. These concerts are also chronicled in this book. 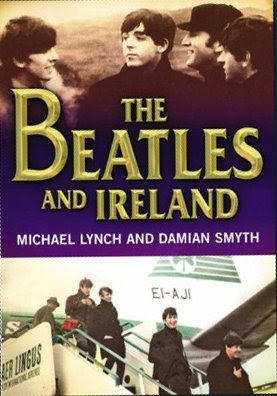 After that, with no more concerts to write about, the bulk of the book explores other connections between Ireland and The Beatles. And it all starts with family ties. Both Lennon, McCartney and Harrison has Irish roots, the strongest of which belong to George, whose Irish mother can trace her family all the way back to when the Normans left France for Ireland in the thirteenth century. While we read about Lennon's visits to his family in Edinburgh in "Beatles in Scotland", this time it's George who takes time out during the Dublin visit to seek out his relatives. His mother also came over to Dublin on this occasion. Apart from this, we could sum up the rest of the book by mentioning that both John and Paul wrote songs about Ireland in 1972 (“Luck of The Irish” and “Sunday Bloody Sunday” from John, “Give Ireland Back To The Irish” from Paul), that John bought the island of Dorinish in 1967 and had it until he died, and that Paul McCartney married Heather Mills in Ireland. The songs are only discussed in brief, but those other subjects are scrutinized thoroughly in the book. We have never before read such a chronology of the island Dorinish before, and we are almost flies on the wall at the McCartney-Mills-wedding, as this event is told by a hired Irish camera man. McCartney and Mills were keen to document their wedding thoroughly, so they hired a movie team with unlimited access to the couple for several days before and at the wedding and reception. The resulting wedding video has never been showed to the public, it was the couple's private momento - just a little bit better filmed and edited than most people's wedding videos! One particularly interesting piece of information from the proceedings was the fact that Paul's daughter Stella specifically asked the camera crew not to include her in the video. This may be evidence that she was opposed to the wedding, as has been rumoured in the press for years. We also get to know that Ringo Starr, who held a speech at the wedding, split from the reception after a very short while. Lennon had Alistair Taylor buy him the island of Dorinish in 1967, when he planned to make it his private retreat, together with Cynthia and Julian. The marriage broke up, and it was John and Yoko who paid the island a visit after a while. When they chose to live in New York City, John gave a group of hippies permission to start a colony there, but they left after a couple of years. With the island abandoned, Lennon still had a romantic dream of returning, perhaps to spend his autumn years there with Yoko. 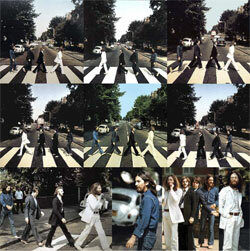 This dream seems to be portrayed in the “(Just Like) Starting Over”-video that Yoko commisioned years later. That dream burst at the slaying of John, and Yoko eventually sold the island to the Gavin family in 1985. The family originally planned to make use of the island as gracing fields, but it was instead left as a wild life reservation. We also get to hear about the easter holidays in 1964, when George and his new girlfriend Pattie took John and Cynthia to the Dromoland Castle Hotel in Co Clare, Ireland. After a pleasant first day there, they woke up the next morning besieged by journalists and photographers. George and John agreed to a photo session, but their holidays had to end and the girls were smuggled out of the hotel in a laundry basket. At this time, George wanted to keep the lid on his new relationship. Also after The Beatles split up, few solo concerts have reached Ireland, but Ringo held a concert at “The Point” in Dublin in 1998 and Paul held a concert in the Royal Dublin Showgrounds during his “Back in the world” tour of 2003. Both are of course presented here, with track listings and concert reviews. Then there's a chapter about The Beatles Ireland fan club, founded in 1993, and Irish Beatles cover band The Quarrymen (later to become The Classic Beatles after John Lennon's original The Quarrymen started playing together again). One amusing chapter is about Irishman Richard Hall who on his way to a family wedding in 1968 decides to drop by Weybridge and say hello to John Lennon! His cheekiness is rewarded when John and Julian not only gives them a tour around the house, but also a great parting gift: Lennon's Ivor Novello statuette, an award for “She’s Leaving Home”! Presenting Irishmen with a reference to The Beatles almost becomes a parody when we get to know the serviceman who serviced Allan Williams' Austin J4 van, the car that brought The Beatles to Hamburg! Appendix 1: An Irish Beatles “Who-is-who”, Listing people from Ireland with a Beatles connection alphabetically, with info of varying length about each one. The most interesting ones here are perhaps ex-Wings member Henry McCulloch, and Gene Mahon who designed the back cover of Sgt Pepper and the Apple logo for the record labels. Other well-known Irish Beatle people are Wilfred Brambell, Freda Kelly. Paddy Delaney, Eamonn Andrews, Spud Murphy, Geoff Rhind and Pattie Boyd! Appendix 2: “Day Trippers” deals with visits to Ireland from Beatles and people from the Beatles' history. This is where Paul and Heather visit Barretstown in 2004, Julia Baird lived in Belfast for a while, Donovan brings George to Kilkullen in 1971, and George visits Ron Wood in 2000, Cynthia Lennon lived in Ireland in the seventies, Paul and Linda drives around Ireland looking for Percy Thrillington in 1971, and Yoko Ono as well as John's sons Sean og Julian have also visited the country. Appendix 3 is about the best known Beatles landmarks in Ireland, but disappointingly the Adelphi Cinema in Dublin, where they played in 1963 has been knocked down. Just one wall is still standing, now part of a parking house. Similarly, the Ritz Cinema in Belfast was torn down, and has been replaced by a hotel. Fortunately, King’s Hall in Belfast is still with us, the venue for The Beatles' 1964 concert. Appendix 4 is of interest to many, we know. 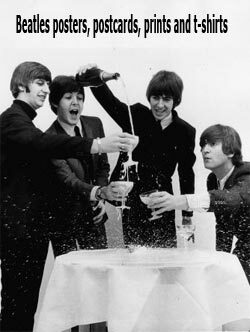 It's the Irish Hit Charts, with Beatles and solo-Beatles releases featured. Let's just mention a few of the more interesting chart facts: “She Loves You” and “I Want To Hold Your Hand” only went to 2nd place in Ireland, and the three 1990's singles “Baby It’s You”, “Free As A Bird” and “Real Love” went to twelfth, fifth and sixth in the charts. We're also noticing that Paul McCartneys “Fine Line” og “Jenny Wren” placed at positions 53 og 60, far from hits, but still, in the charts! 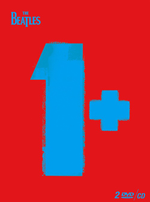 John's “Imagine”-single made a comeback at position no. 3 in 1999, and George's “My Sweet Lord” went to number five in 2002. Ringo had a few good hits during 1971-1974, but nothing after that. When it comes to album charts, they weren't compiled in Ireland until the 1990's. Thus, the album chart lists starts with “Live At The BBC” who went ninth in 1994, and the “Anthology” collections all ended up on sixth. “Sgt. Pepper” made a surprise appearance on the album lists in 1997 despite there not being an anniversary edition, it still goes to a respectable eighteenth place in the Top 40. “Yellow Submarine Songtrack” peaks at a disappointing 22nd place, but “1” bringes Beatles to the toppermost in 2001. “Let It Be…Naked” is in at seven, and “Love” peaked at a good 3d place in the Irish album charts. Paul McCartney's album hits in Ireland starts with “Flaming Pie” at 21. and ends with “Memory Almost Full” at 30. Highest placement was “Wingspan” which ended up at 10. Lennon has two collections in the charts with “Lennon Legend” on 5th, while “Working Class Hero” only managed 21st as best placement. George is only represented together with the Traveling Wilburys on the album charts, with the 2007 boxed set which actually made it to the top and stayed in the Top 40 for 13 weeks. 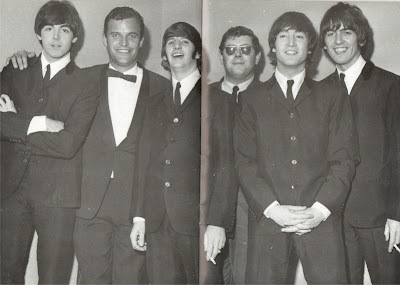 Appendix 5 is “Beatle Interviews”, starting with a transcription of the Beatles chat on Granada TV's “Scene at 6:30” on the 20th of December 1963. A bit less interesting is a transcription of a radio interview with Allan Williams and Bob Wooler from 1984, but a good, long Ringo interview from 1998 and a lackluster McCartney interview from 2003 saves the chapter. Appendix 6 is called “Irish Broadcasting and the Beatles” and deals with what the title says, Irish radio- and TV-shows with and about the Beatles and ex-Beatles with a short description of each show. The book is illustrated throughout, with photos, partly rare ones, and documents and concert tickets, all rendered in black and white. It ends with something every good reference book needs, an index. 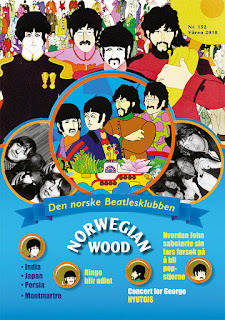 We at WogBlog fully support these national Beatles book, every country should have one! Ringo Star also has Irish heritage. He has several lines of Irish ancestry. One was his great grandmother Mary James, who married George Parkin, daughter of Irish immigrant Thaddeus James. Another Irish ancestor was William Conroy who came to Liverpool in the 1870s. New studio album from George Harrison?